€600,000 colt: The Oldenburg son of Belantis/Sir Tender/Welton/Figaro has been sold to Sweden. A son of Belantis sold for the top price of €600,000 ($NZ1.03 million; $US700,000) at the Oldenburg Stallion Market in Vechta, Germany at the weekend. The grey two-year-old was also named champion stallion. Bred and exhibited by Angelika Krause from Ellerbek, the colt was knocked down to buyers from Sweden. His sire, Belantis, competed with Isabell Werth up to Intermediaire I level. His pedigree also features leading jumpers and driving horses. The sale-topping colt by Belantis was also named Champion Stallion at the Oldenburg Stallion Market. The second highest price was paid for a colt by Don Schufro/Stedinger/Dinard L/Ramiro, bred by Heinz and Elisabeth Schulte from Ahlen. The licenced colt was bought by Lone Boegh Henriksen, Andreas Helgstrand and Paul Schockemöhle for €320,000. Oldenburg’s high quality show jumpers were also in demand. Johannes Heinrichs from Heinsberg won the bidding of the OS Champion Stallion by Casallco/Calido/Corofino/Alcatraz, bred by Paul Forkert from Bremen. He sold for €160,000. The second highest priced show jumper was a colt by Cornet Obolensky/Diamant de Semilly/Sandro, bred by Michael Schwarz from Zierenberg. A jumping stable from Lower Saxony bought him for €95,000. A total of five of the 17 dressage colts in dressage were sold abroad, and seven of the 19 jumping colts also went abroad. The Oldenburg dressage colts brought a total of €1,959,000 and the average price for licensed stallions levelled off at €143,462. The average price of stallions that were not licensed was €23,500.The total sales for the Oldenburg jumping colts was €943,000, and bidders had to pay an average price of €57,467. The total sales of this year’s Stallion Market in Oldenburg was up about €200,000 compared to last year. Dressage main premium winner Asgard’s Ibiza. Asgard’s Ibiza and Ogano were both named Oldenburg main premium winners at the Stallion Market. 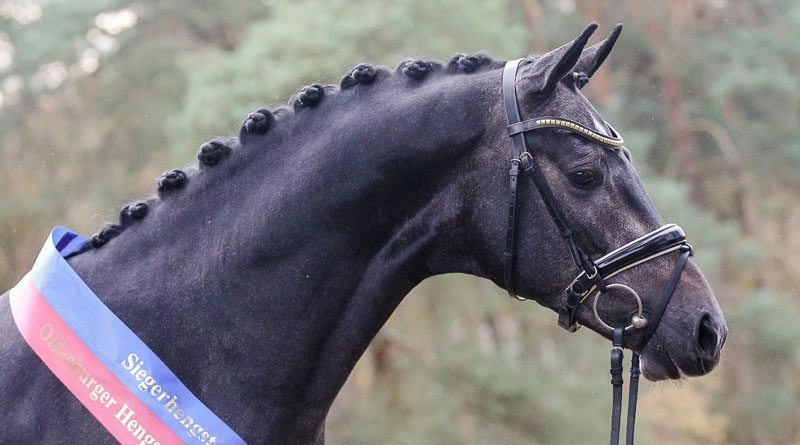 Five-year-old stallion Ogano (Ogano Sitte x Jamaica van de Beemden/Diarado/Cantus), bred by Willy Hendrix in Belgium, and owned by Gerd Sosath from Lemwerder, Germany, received the jumping title. He completed his 30-day test in Schlieckau with a final jumping score of 8.15, and in his sport test this year his final score was 9.2. The main premium in dressage was four-year-old Asgard’s Ibiza (Desperado x Bolympia W/Jazz/Contango), bred by L. Boogert from the Netherlands, and owned by Hengsthaltung Ludwig Kathmann from Holtrup, Germany. Asgard’s Ibiza was licensed in 2015 in Vechta and already has offspring at the Oldenburg Elite Foal Auctions. He finished his 14-day test in Adelheidsdorf with a final dressage score of 8.81.